does not leave any marks on their surfaces. Furthermore, using the ‚tearing method‘, no inner burrs exist and the reduction of the inner tube-diameter is extremely small, so that e. g. a mandrel for further bending can be inserted without prior postprocessing of the joint face. The process is as follows: The circular cutting knife circulates around the fixed tube and is positioned, so that the tube wall is cut by the knife. Prior to complete cutting of the tube wall, however, the knife is drawn back and the truncated tube end is ‘torn’. Thereby no inner burring occurs, which would only exist when completely cutting the tube. As the chipless separation process results in a squeezing out of the raw material, a slight ‘outer bead’ exists at the joint face. This is automoatically squeezed away by means of a roll, circulating parallely to the knife, so that the tube surface at the joint face is leveled again. In case the tube ends have to be provided with inner- or outer chamfers, a machining with chips is needed. 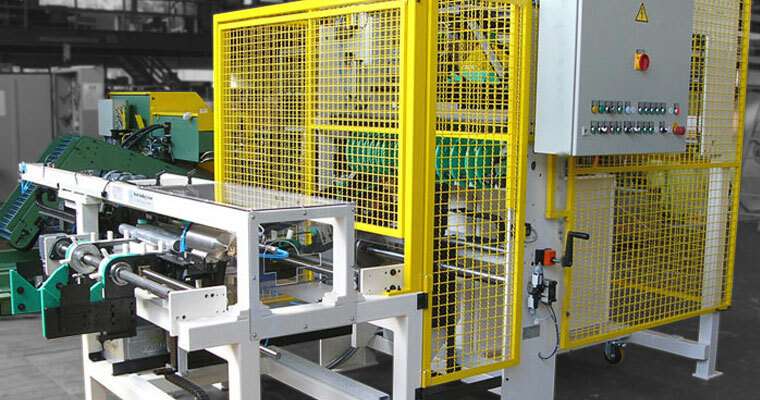 For this purpose the tube cutting machine can be linked to an end processing machine. This machine, which can also operate as a ‚stand-alone‘-module, is equipped with a new internal transport method for the tube, so that vulnerable gripper units can be avoided. The tubes are clamped hydraulically and centrically by form- or prism jaws. The tubes can as well be planed or be furnished with inner- or outer chamfers. Length tolerances are at about ± 0,05 mm. A length measuring system can be installed, whereas non-accurate parts are automatically separated. The processing is effected via two variable speed motors, which are adjusted via servo-controls, whereas the shape of the tube ends is produced in one process. The cycle time for normal operations is between 4 and 8 sec., depending on the material and its wall thickness. Steel, copper or aluminium tubes can be processed.